She had a deprived childhood/comes from a deprived background. Small businesses are the soft underbelly (= weakest parts) of the economy, and they need as much government support as possible. The article takes a harsh look at the dark underbelly of professional sports. The park was littered with bottles and soda cans after the concert. Dirty clothes littered the floor of her bedroom. Paper cups littered the ground. The room was littered with broken glass. A memorial to her was erected after her death. They decided to erect a bridge across the Niagara Gorge. The war memorial was erected in 1950. The soldiers had erected barricades to protect themselves. You cannot shelter your children from the realities of life. We were caught in a thunderstorm, without anywhere to shelter. A group of us were sheltering from the rain under the trees. I really have to force myself to be nice to him. You can’t force her to make a decision. Hospitals are being forced to close departments because of lack of money. Bad health forced her to abandon her studies. Lack of skills forces these young men into low-paid jobs. Despite the pain, she forced herself to get out of bed. We live in an affluent neighborhood. Rubbish bags piled up by the pavements and littered across streets. Tents erected in clusters where people have camped down for the night. Dozens of directionless residents congregating by the roadside and wandering into the road. 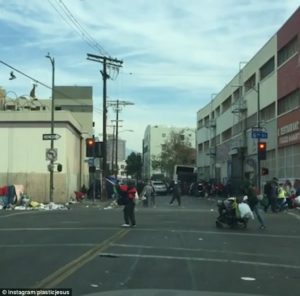 This is what Christmas Day looked like for thousands of homeless people in the dark and dingy underbelly of Downtown Los Angeles this year. We piled plenty of logs up next to the fire. A group of boys were piling branches in a heap for their bonfire. People stood in clusters around the noticeboards. All his grandchildren clustered around him. Have a look at the cluster of galaxies in this photograph. There was a cluster of fans around him, asking for autographs. Tourists congregated outside the palace. A crowd congregated around City Hall. A crowd congregated around the entrance to the theatre, hoping to catch a glimpse of the stars of the show. Her hair was a dingy brown colour. The stores seemed old and dingy, their lights too dim and their ceilings too low. 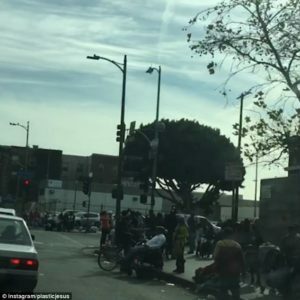 The shocking footage – captured using a car dash camera – shows the brutal reality of life on the street for some 20,000 people in the notorious Skid Row district. Shot on 5th Street, 6th Street and San Pedro Street, it is a stark glimpse into the day-to-day existence of some of the country’s poorest citizens – including women and children. 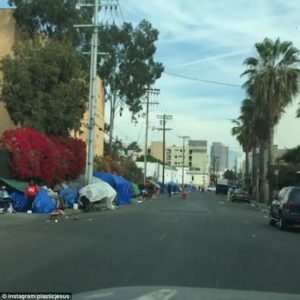 This area of LA’s central business zone is considered to be one of the most dangerous places to live in the city. She disliked the stark brick walls and the steel window frames. The hill formed a stark silhouette against the sky. It was a stark room with a bed and chair as the only furniture. The stark reality is that we are operating at a huge loss. In the suburbs the spacious houses stand in stark (= extreme) contrast to the slums of the city’s poor. Too many community leaders seem unable to grasp this stark reality. He caught a glimpse of her face. The crowd were anxious for a glimpse of the President. I only caught a glimpse of it, but I think it was a badger. He glimpsed a short white-haired figure heading for the back gate. In the villages you’ll have a fascinating glimpse of Turkish country life. This biography offers a few glimpses of his life before he became famous. Your day-to-day responsibilities will include sorting the mail and making appointments. 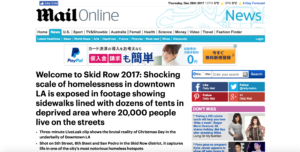 In Skid Row – one of the notorious homeless hotspots in the area – nine toilets are shared by some 2,000 people, according to a June report titled ‘No Place to Go‘. A lucky few will find food and somewhere warm to sleep at shelters and rescue missions. But many are left to navigate the industrial sprawl and smoke alone. The three-minute clip was originally published on Instagram by LA street artist Plastic Jesus then on LiveLeak by Nick Stern in the ‘Citizen Journalism’ video category. It had only been live for 10 hours when it was viewed nearly 40,000 times. In one frame of the viral footage, a man can be seen pushing a wheelchair in the middle of the road. Another wheelchair-bound man reclines listlessly on a street corner while women file their thin-looking children through the crowds. Makeshift canopies – often simply sheets erected on poles – are packed in tightly beside one another in endless rows. His mother is sick and more or less house-bound. She was reclining elegantly on the sofa. He reclined his head against/on my shoulder. The heat made us all feel listless. He‘s seemed listless and a little depressed ever since he got his exam results. Students filed into the lecture hall. The visitors filed through the entrance to the ticket offices. The bride’s family filed in. Many animals live in the forest canopy. The rising cost of rent and housing in California is also forcing middle class residents into alternative accommodation. 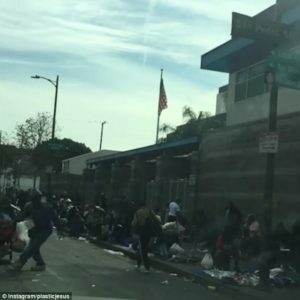 Workers end up living in their cars by the roadside and hundreds of people – including nurses and chefs – sleep in parking lots in affluent areas like Santa Barbara. For example, nursing assistant Marva Ericson has been sleeping in her Kia for the past three months. She showers at her local YMCA then gets dressed in her hospital scrubs for work. The problem is so widespread that a Safe Parking Program was introduced in the area 12 years ago. It allows clients to stay overnight in the parking lots of churches, not-for-profits and government offices. In Santa Barbara alone, there are 23 parking lots currently used for the program. I saw a photo of her in doctor’s scrubs. I left my car in the mall parking lot. Though ranked as one of the wealthiest nations, the US is home to some of the poorest communities in the world. The wealthiest one per cent of American households own 40 percent of the country’s wealth, according to a November report by economist Edward N. Wolff. That same one per cent of households own more wealth than the bottom 90 per cent combined, the Washington Post reported. He’s a very wealthy man. Many wealthy businessmen contribute to political parties. Only the very wealthy could afford to travel abroad. A lot of wealthy people have their own personal trainer.